RESTORE YOUR OLD & DAMAGED PHOTOS. Photo Restoration from Fix-Your-Pix providing the expertise to restore old photos and photographic repair. Photo Retouching is carried out on your old and damaged photographs. They can be digitally retouched and restored to their former glory by our professional photograph restoration team. Fix-your-pix specialises in old photo restoration and photo repair. We offer a unique online photo restoration service to repair damaged photos and images. This is a risk-free service. Fix-Your-Pix does not expect payment for any photo retouching carried out until you are 100% happy with your photo restoration. 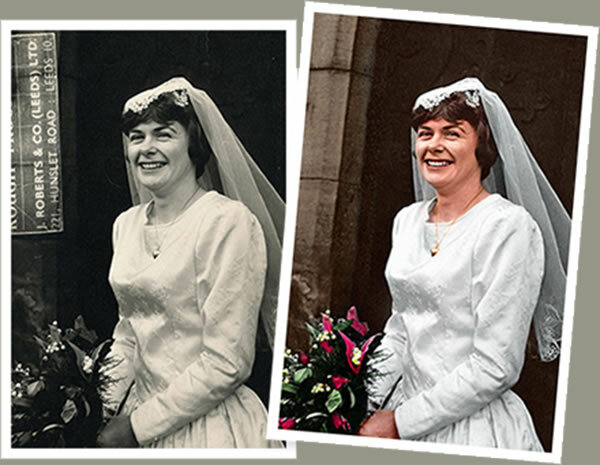 You can check your repaired photographs online before you pay using our state of the art online photo restoration review service. Why Should You Restore Old Photos? Ready to bring history back to life? Restoring old photos is the easiest way to step back in time and honor the memories you hold dear of loved ones and special experiences. But did you know that there are even more reasons why you should restore your old photos? When you restore old photos, you don't just bring history into the present day. You can also explore a new type of creativity and discover more about your own heritage. Read on to learn about all the reasons why you should consider photo restoration for those old photos that have been lying around in your attic for years. Then get started on your photo restoration project today! People most commonly restore old photos that have been in the family for a while. Typically these photos present prior family members and their own memories. When you restore these photos of your ancestors, you'll be able to pay them your respects by bringing their stories back to the present day. Others will be able to more clearly experience their memories and history. If you have an ancestor's memorial service coming up or are looking for a way to memorialize a deceased family member, restoring old photos is your answer. Restored photos can provide a professional way to honor the generations that came before. You'll find this to be true when you restore old photos, especially if you're restoring family photos that have been in the family for generations or years. You may find yourself filling in gaps in your history you never knew existed. Restoring old photos may inspire you to learn more about your heritage. You may find yourself filling out your family tree or asking Aunt Bertha to tell you more stories about the faces you've brought back to life in your restoration project. While every family is different and has its good and bad sides, you'll likely be surprised and even intrigued by what you discover, especially once you find out who you really are related to. Restoring old photos can be enlightening, and provide many opportunities for education. When you restore old photos, you get a chance to learn about a creative process that has been inspiring people for decades. Once you see your old photos restored to modern perfection, you'll get a chance to explore history anew and perhaps cultivate a new interest in photography and restoration further. You may start by getting photos restored as a personal project, or as in addition to your current family history explorations. Maybe restoring a photo or series of photos will open up a new pathway historically. Before you even start restoring your photos, think about the end result and whether you should be printing them on canvas, metal, or even wood. You may even want to consider photo enlargement, depending upon the display you are going for. Whether your photo restoration brings to life your family history or simply other lives and stories, you'll doubtless be inspired. Getting a chance to visualize other moments in history will give you some perspective about the present day and scope of the future. This is one of the biggest reasons you should restore old photos. Looking at restored photos can have the effect of reading biographies and other books. You'll gain a new sense of belonging and understanding of interpersonal connections. You may even want to write a story, poem, or book, or start conversations with friends or colleagues who are interested in history. Who knows? Maybe you'll break out that old history textbook or pick up that autobiography you've been meaning to read for a few weeks now. Why keep your restored photos in a photo album you may only open a handful of times? Restored old photos really are beautiful to witness, and can definitely serve as beautiful additions to the walls in your home. Once you've restored your photos, think about how you can bring them into your house so that the preserved memories stay fresh. Decorating your home with restored old photos can simultaneously tell your family's story and spruce up your living spaces. When restoring your photos, choose some classic frames or other displays to show off your beautiful new photos. Match these frames with your home's existing decorative theme for added elegance. When friends and visitors stop by, they too will be inspired by the photo restoration on your walls and bookshelves. You may inspire them to rescue their old memories and restore their own family histories! You'll also always have a conversation starter for any gathering or party at your home when your photos are on display. Who doesn't love hearing about other people's lives through intriguing photographs? Having your restored old photos on the walls of your home means the potential for creating new perspectives and conversations about your history and the history of others. When you restore old photos, you create a sense of community that is rare to find in other places. Everyone loves receiving photographs as gifts. Restored photos make a particularly wonderful gift for loved ones and family members, especially photographs that present a meaningful memory. In this case, restored old photos can say so much more than a card. You'll make Grandma's day by restoring old photographs of her deceased husband or inspire your sister with restored images of your parents in their youth. The opportunities for gifts are endless. If you are thinking about restoring some old photos to give as gifts to the important people in your life, make sure you choose the proper frame or display. The delivery is also important, particularly if you'll be wanting the recipient to be displaying the restored photo in the future. When you restore old photos, you can check off all of the people on your list for Christmas, birthdays, and other holidays. Old photos are typically lying about in random storage containers and boxes in attics, living rooms, and closets. It's important to treat your old photos with care, otherwise, the memories can quickly deteriorate. With Photo Restoration, you'll be able to take the best care possible of these memories and ensure that they are not lost. You'll be able to streamline and organize all of the collections that you have. You'll also be able to display and store these restored old photos effectively in the future. Photo Restoration means getting rid of those dusty boxes and containers, de-cluttering your attic, and freeing up more space for future memories in your home. When you restore old photos, you find an easy means of decluttering that doesn't involve trips to the thrift store, yard sales, or garbage bags of junk! If you are restoring old family photos, you'll be able to experience one of the best benefits of restoration: sharing the experience with family. You'll be able to connect with other family members through restored photos, perhaps through a viewing party or by exchanging old photos as gifts. Who ever turned down an invitation to browse through the family album? You'll enhance this traditional activity with clear, crisp, beautiful photos that everyone will be able to recognize. You'll learn even more stories about your family and share some laughter and tears along the way. Get a spot on the couch and let the reminiscing begin once you restore old photos! If you have your own family, you can restore old photos and then set the precedent for generations to come. You'll be able to pass on your heritage to your children and grandchildren and inspire them to learn more about their past as they prepare for the future. Particularly as we are moving into the increasingly digital age, it's critical to teach the next generations to value historic artifacts and stories told through older photographs. It won't be long before old photographs become rare to even find. If you're looking for a fantastic, timeless tradition to begin in your family, think about beginning with some photo restoration. There are countless benefits to digging up that old box of photos in the attic and getting them restored. At the top of the list is the family connection that naturally stems from this experience, and your ability to return to histories that may have been forgotten otherwise. When you restore old photos, you get a chance to explore your own creativity, create gifts for friends and family, and organize your existing photograph collections. Bring your family's history back to life and engage with your own heritage in a unique way. At Fix Your Pix, we understand the profound benefits of photo restoration and meet your needs accordingly. We offer seamless, exciting, and beautiful old photo restoration at an affordable price. We love bringing your history to life! Read our testimonials to see why we're a big deal, and then let us know how we can get you started on your photo restoration journey today! Photo Print or Canvas print your restored photo to show off the results. We offer great value for money, starting at only £9.99 per image.